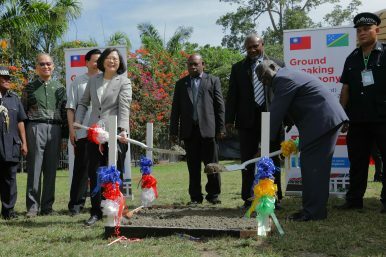 Tsai Ing-wen (fourth from left) attends a groundbreaking ceremony for the Solomon Islands Crafts Market Center with Prime Minister Manasseh Sogavare (Nov. 3, 2017). While China has been making the headlines, today’s release of the Lowy Institute Pacific Aid Map reveals that China isn’t the only nontraditional partner that has been busy in the region. Taiwan has been eagerly shoring up its relationships as well. The Pacific Aid Map is an interactive tool that has been developed by the Lowy Institute over the past 18 months to enhance aid effectiveness in the Pacific by improving coordination, alignment, and accountability of foreign aid through enhanced transparency of aid flows. The Pacific Aid Map has collected data on close to 13,000 projects in 14 countries from 62 (traditional and nontraditional) donors from 2011 onwards. This raw data has been made freely available on an interactive multifaceted platform, allowing users to investigate the data in a variety of ways. The Pacific Aid Map reveals, for the first time, the scope of Taiwan’s engagement in the Pacific Islands region. The Pacific Islands is an important region for Taiwan. After Burkina Faso, the Dominican Republic, Panama, São Tomé and Príncipe, all cut ties with Taipei in the last two years, a full third of nations maintaining diplomatic relations with Taiwan are now in the Pacific Islands. These nations – Kiribati, the Marshall Islands, Nauru, Palau, the Solomon Islands and Tuvalu – have a combined population of just over 800,000, three quarters of which are based in the Solomon Islands. Given this concentration of support in the Pacific Taiwan has been on the charm offensive with these countries, with President Tsai Ing-wen recently touring the region. These countries also receive significant financial support from Taiwan. The Pacific Aid Map has collected data, through a combination of budget materials, government announcements, and social media sources, on Taiwan’s aid to the Pacific. For the period of 2011-2016 our data shows that Taiwan has given more than $190 million to its supporters in the Pacific. This likely undersells the amount Taiwan has given to the region – budget documents from both Palau and Tuvalu are quite opaque on the subject, as is the Taiwan government. Taiwan has also contributed close to $20 million to countries in the region that it does not have formal diplomatic relations with. When looking at the region as a whole, Taiwan emerges as the 10th largest donor to the Pacific. China, on the other hand, over the same 2011-2016 period, (while committing much larger sums) has spent five times as much in the Pacific in the countries that it maintains diplomatic relations with in a mixture of concessional loans and grants. Taiwan only gives to region through grants (investments that don’t need to be paid back). On a per capita basis, however, because the China-supporting countries are so much larger than the countries that recognize Taiwan, Taiwan actually spends $237 to China’s $108, more than twice as much. When isolating just Chinese grants, which make up about 30 percent of their total aid investments, and comparing like-for-like, this ratio shoots up to seven times as much. Support in the region does not come cheap. Taiwan’s presence in the Pacific tends to fly under the radar for three reasons. The first is the way in which they operate, on a much smaller scale through grant-based financing. Taiwan’s average project in the Pacific is 5 percent that of China’s, and half that of Australia’s. Where China is focused on highly visible large infrastructure projects, Taiwan’s assistance is very spread out. The second is that Taiwan, unlike China, has not used its aid program as a vehicle for the Chinese diaspora and private sector to take root in the Pacific. Even in places like the Solomon Islands, without the presence of the China aid program, small-scale commercial activity is becoming increasingly Chinese. Finally, Taiwan’s presence in the region does not resonate with the broader narrative being discussed in Western capitals around the world about how to deal with a new, Chinese-driven, multipolar world. That isn’t to say Taiwan’s engagement has been unnoticed. It has significantly impacted lives of those in the Pacific, in some cases profoundly. The clearest case of this is in Solomon Islands. The primary mechanism for Taiwanese support to Solomon Islands comes in the form of supporting “Constituent Development Funds” – a discretionary fund that is allotted to each of the country’s 50 MPs for investing in their electorates (with minimal oversight). Taiwan has provided close to $90 million to these funds between 2011 and 2018. Solomon Island politicians like these funds so much that they have allocated around one-third of the development budget, or between 10 and 15 percent of the total budget, to these funds. In this regard, Taiwan’s aid program has contributed to profoundly changing, and perhaps undermining, public financial management in its largest supporter in the Pacific. (For a more nuanced discussion on the challenges of being an MP in Solomon Islands, take a look at now Prime Minister Rick Hou’s reflections for the Department of Pacific Affairs in 2016). While the fault lines in the Pacific between Chinese and Taiwan support have been set since 2006, the Pacific Aid Map reveals that neither side has been staying idle. With the swaps of diplomatic relations elsewhere in the world in recent years, it’s safe to say that these investments will continue apace. One country sticks out though – Palau, the Western-most nation in the Pacific. Taiwan has had notable tensions with Palau in recent years. Palau has also been starved of its aid funding from the United States between 2011-2016; its two peer compact states, Marshall Islands and the Federated States of Micronesia, have received 6 times and 10 times more aid respectively. China is also putting the squeeze on the bilateral tourism industry with Palau – a critical source of economic activity. Jonathan Pryke is the Director of the Pacific Islands Program at the Lowy Institute. Alexandre Dayant is a Research Fellow in the Pacific Islands Program at the Lowy Institute. A Smooth Solomon Islands ElectionAustralia's Pacific Step-Up: More Than Just TalkUN Recommends Graduating 2 Pacific Island States From the LDC CategoryAt Melanesian Spearhead Group, the Question of West Papuan Membership LingersRAMSI Ends: What’s Next for the Solomon Islands?